The multiexpedition Integrated Ocean Drilling Program/International Ocean Discovery Program (IODP) Nankai Trough Seismogenic Zone Experiment (NanTroSEIZE) project was designed to investigate fault mechanics and seismogenesis along subduction megathrusts through direct sampling, in situ measurements, and long-term monitoring in conjunction with allied laboratory and numerical modeling studies. Overall NanTroSEIZE scientific objectives include characterizing the nature of fault slip and strain accumulation, fault and wall rock composition, fault architecture, and state variables throughout the active plate boundary system. Expedition 380 was the twelfth NanTroSEIZE expedition since 2007. Refer to Kopf et al. (2017) for a comprehensive summary of objectives, operations, and results during the first 11 expeditions. 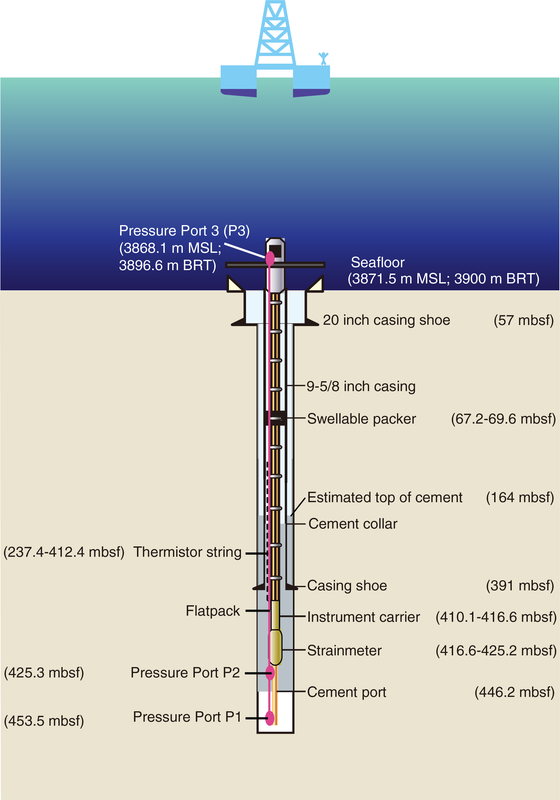 Expedition 380 focused on one primary objective: riserless deployment of a long-term borehole monitoring system (LTBMS) in Hole C0006G in the overriding plate at the toe of the Nankai accretionary prism. The LTBMS installed in Hole C0006G incorporates multilevel pore-pressure sensing and a volumetric strainmeter, tiltmeter, geophone, broadband seismometer, accelerometer, and thermistor string. Similar previous LTBMS installations were completed farther upslope at IODP Sites C0002 and C0010. The ~35 km trench–normal transect of three LTBMS installations will provide monitoring within and above regions of contrasting behavior in the megasplay fault and the plate boundary as a whole, including a site above the updip edge of the locked zone (Site C0002), a shallow site in the megasplay fault zone and its footwall (Site C0010), and a site at the tip of the accretionary prism (the Expedition 380 installation at Site C0006). In combination, this suite of observatories has the potential to capture stress and deformation spanning a wide range of timescales (e.g., seismic and microseismic activity, slow slip, and interseismic strain accumulation) across the transect from near-trench to the seismogenic zone. Expedition 380 achieved its primary scientific and operational goal with successful installation of the LTBMS to a total depth of 457 m below seafloor in Hole C0006G. The installation was conducted in considerably less time than budgeted, partly because the Kuroshio Current had shifted away from the NanTroSEIZE area after 10 y of seriously affecting D/V Chikyu NanTroSEIZE operations. After Expedition 380, the LTBMS was successfully connected to the Dense Oceanfloor Network System for Earthquakes and Tsunamis (DONET) in March 2018 using the remotely operated vehicle Hyper-Dolphin from the Japan Agency for Marine-Earth Science and Technology (JAMSTEC) R/V Shinsei Maru. Subduction zones account for ~90% of the global seismic moment release and can generate damaging earthquakes and tsunamis with potentially disastrous effects on heavily populated coastal areas (e.g., Lay et al., 2005; Moreno et al., 2010; Simons et al., 2011). Understanding the processes that govern the strength, nature, and distribution of slip along these plate boundary fault systems is crucial in evaluating earthquake and tsunami hazards. Characterizing fault slip behavior and mechanical state at convergent plate boundaries through direct sampling, near-field geophysical observations, measurement of in situ conditions, and shore-based laboratory experiments is a fundamental and societally relevant goal of current earth science and the overarching goal of the Integrated Ocean Drilling Program/International Ocean Discovery Program (IODP) Nankai Trough Seismogenic Zone Experiment (NanTroSEIZE) project. Expedition 380 was the twelfth Integrated Ocean Drilling Program/IODP expedition since 2007 to address the NanTroSEIZE project’s objectives. The fundamental scientific objectives of NanTroSEIZE include characterizing the nature of fault slip and strain accumulation, fault and wall rock composition, fault architecture, and state variables throughout the active plate boundary system through direct sampling, in situ measurements, downhole experiments such as walk-away vertical seismic profiles, and long-term monitoring in conjunction with allied laboratory and numerical modeling studies (Tobin and Kinoshita, 2006). See Kopf et al. (2017) for the most recent comprehensive summary of the rationale and history of the NanTroSEIZE project and regional survey data. To date, NanTroSEIZE has involved coring, logging, and installation of long-term borehole observatories at 14 sites in a trench–normal transect across the Nankai Trough subduction zone offshore the Kii Peninsula of southwest Honshu Island. This transect runs from the Kumano Basin in the fore-arc region ~60 km landward of the trench axis to the Kashinosaki Knoll on the downgoing plate ~40 km seaward (Figures F1, F2). Figure F2. Interpreted seismic cross section and LTBMS site locations. The Nankai Trough is formed by subduction of the Philippine Sea plate to the northwest beneath the Eurasian plate at a rate of ~65 mm/y (Miyazaki and Heki, 2001; DeMets et al., 2010). The convergence direction is slightly oblique to the trench, and trench wedge turbidites and underlying Shikoku Basin hemipelagic sediments accrete at the deformation front. The Nankai Trough region has 1300 y of historical and archeological records of recurring great earthquakes that are typically tsunamigenic, including the 1944 Tonankai Mw 8.2 and 1946 Nankaido Mw 8.3 earthquakes (Ando, 1975; Hori et al., 2004). The rupture area and zone of tsunami generation for the 1944 event (in which the Expedition 380 site is located) are now reasonably well understood (Tanioka and Satake, 2001; Ichinose et al., 2003; Kikuchi et al., 2003; Baba and Cummins, 2005; Baba et al., 2005, 2006). Land-based offshore geodetic studies suggest that the plate boundary thrust is currently strongly locked (Miyazaki and Heki, 2001; Yokota et al., 2016). Similarly, lower microseismicity levels near the updip edge of the rupture area of the 1940s earthquakes (Obana et al., 2001) imply significant interseismic strain accumulation on the megathrust. Recent geological studies at the Nankai margin (Sakaguchi et al., 2011; Yamaguchi et al., 2011), direct observational evidence from the 2011 Tohoku earthquake (e.g., Fujiwara et al., 2011; Ito et al., 2013), and new results from both a seafloor cabled network and long-term borehole monitoring system (LTBMS) installations ~25–35 km landward of the trench along the NanTroSEIZE transect (Wallace et al., 2016; Araki et al., 2017) suggest that the décollement or frontal thrust is capable of storing and releasing elastic strain and may participate in both periodic slow slip events (SSEs) and megathrust earthquakes. Observations of very low frequency (VLF) earthquakes and tremors within or just below the accretionary prism in the drilling area (Obara and Ito, 2005; Ito and Obara, 2006; Obana and Kodaira, 2009; Sugioka et al., 2012) demonstrate that interseismic strain is not confined to slow elastic strain accumulation. 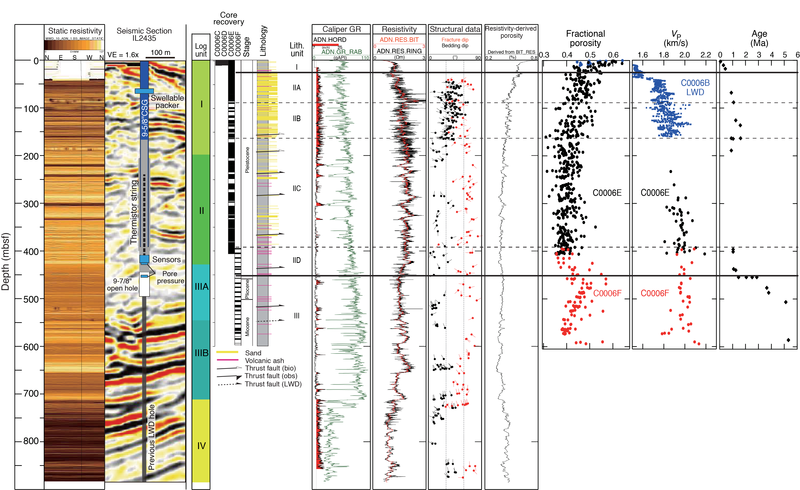 New observations from two LTBMSs installed at IODP Site C0010 and Integrated Ocean Drilling Program Site C0002, located ~25–35 km from the trench, reveal repeating SSEs that extend to <25 km from the trench, are accompanied by low-frequency tremor, and recur approximately every 12–18 months (Araki et al., 2017). These SSEs may accommodate as much as 50% of the plate convergence budget, indicating that quasiperiodic accumulation and slow slip release of strain on the shallowest megathrust play an important role in the earthquake cycle. Monitoring of this region is therefore a high priority to detect interseismic strain accumulation and release to better understand outer wedge megathrust processes. Expedition 380 returned to Site C0006 in the toe of the Nankai accretionary prism ~2 km landward of the trench axis (Figure F3). The sole objective of Expedition 380 was riserless installation of an LTBMS from the seafloor to 457 m below seafloor (mbsf) in the hanging wall above the plate boundary fault. The objective was completed in Hole C0006G after it had been drilled to 495 mbsf (Table T1). Site C0006 was logged and cored during two of the initial NanTroSEIZE expeditions, 314 and 316 (Kinoshita et al., 2009; Screaton et al., 2009). The LTBMS was of the same general design as the borehole observatories previously installed in Hole C0010A farther up the accretionary prism (Kopf et al., 2017) and Hole C0002G at the southeastern edge of the Kumano Basin above the prism (Expedition 332 Scientists, 2011). Those two LTBMSs are already connected to the Dense Oceanfloor Network System for Earthquakes and Tsunamis (DONET), and the LTBMS in Hole C0006G was successfully connected in March 2018, shortly after Expedition 380. This transect of three observatories should provide unprecedented resolution of the state of stress and strain in the leading edge of the overriding plate from the near-trench region to the seismogenic zone on a wide range of timescales, with near–real time data freely available to the scientific community. Figure F3. Interpreted seismic depth section. The Expedition 380 LTBMS in Hole C0006G was the third LTMBS installed in the NanTroSEIZE transect. Previously, an LTBMS was installed in Hole C0002G during Expedition 322 in 2010 (Expedition 332 Scientists, 2011), and another one was installed in Hole C0010A during Expedition 365 (Saffer et al., 2017). With the addition of the Expedition 380 installation, the array of three LTBMSs now extends ~35 km seaward from the Kumano Basin to the toe of the accretionary prism. The transect spans locations in and above regions of contrasting behavior in the megasplay fault zone and plate boundary as a whole. Recent studies and discussion suggest that the “megasplay” below Site C0002 is more likely to be the active plate boundary, which can mechanically connect either to the décollement or the shallow out-of-sequence thrusts, whereas the underlying reflector (top of oceanic crust) is probably not active (Moore et al., 2007; Strasser et al., 2009). The LTBMS sites include a site above the updip edge of the “locked” zone (Site C0002), a shallow site in the splay fault zone and its footwall side (Site C0010), and a site at the tip of the accretionary prism (Site C0006). 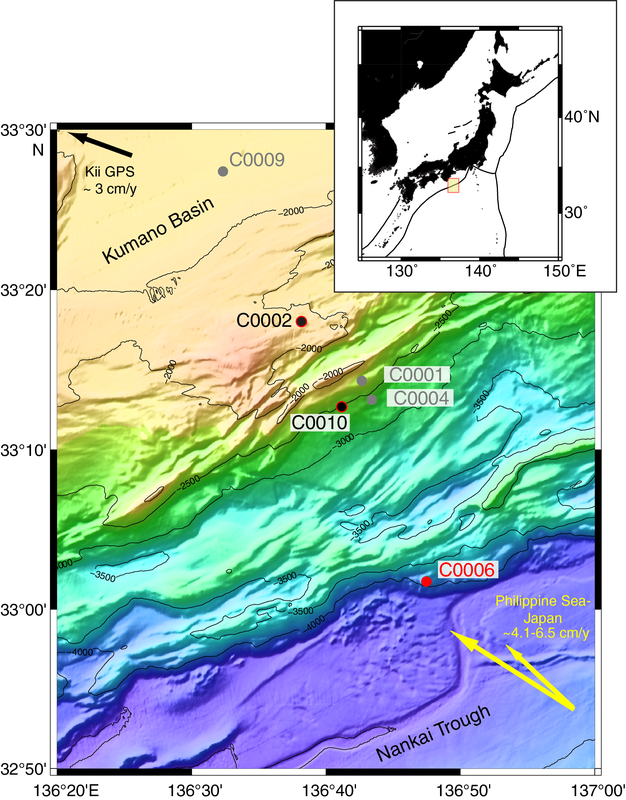 Placing the LTBMSs at these sites was motivated by observed slip in the 11 March 2011 Tohoku earthquake, which indicated that at some margins, coseismic rupture may propagate along the plate boundary all the way to the trench (e.g., Fujiwara et al., 2011). The importance of this is emphasized by newly observed, repeating SSEs within <25 km of the trench (Araki, et al., 2017). The suite of NanTroSEIZE observatories has the potential to capture, in unprecedented detail, seismic and microseismic activity, slow slip, and interseismic strain accumulation across a transect from the near-trench to the seismogenic zone. Such temporally continuous and spatially distributed observations are necessary to understand how each part of the plate boundary functions through the seismic cycle of megathrust earthquakes. The LTBMS in Hole C0006G shares the same general design as the two LTBMSs previously installed in Holes C0002G and C0010A (see the Expedition 380 methods chapter [Kinoshita et al., 2018a]). The Hole C0006G LTBMS includes an array of sensors designed to monitor slow crustal deformation (e.g., strain, tilt, and pore pressure as a proxy for strain), seismic events such as VLF earthquakes, hydrologic transients associated with strain events, ambient pore pressure, and temperature. To ensure the long-term and continuous monitoring necessary to capture events that occur over a wide range of timescales, the borehole observatory was connected to the submarine cabled observation network (DONET; http://www.jamstec.go.jp/donet/e) in March 2018 to provide power and allow for higher sampling rates than can be achieved in a standalone mode. The Site C0002 and C0010 LTBMSs are already connected to this network, and the data from all three LTBMSs can be viewed and downloaded from the J-SEIS open access data portal (http://join-web.jamstec.go.jp/join-portal/en). No new coring or logging was conducted during Expedition 380. Site C0006 was originally drilled during Expedition 314 with measurement while drilling (MWD) and then logging while drilling (LWD) to 885.5 mbsf in two holes ~30 m apart. Expedition 316 cored four holes at Site C0006 to a maximum depth of 603 mbsf. The LTBMS design and operational plan were based on these previous results, especially the continuous logging profiles. Therefore, the new Expedition 380 LTBMS in Hole C0006G was positioned midway between the two Expedition 314 MWD/LWD holes (C0006A and C0006B). 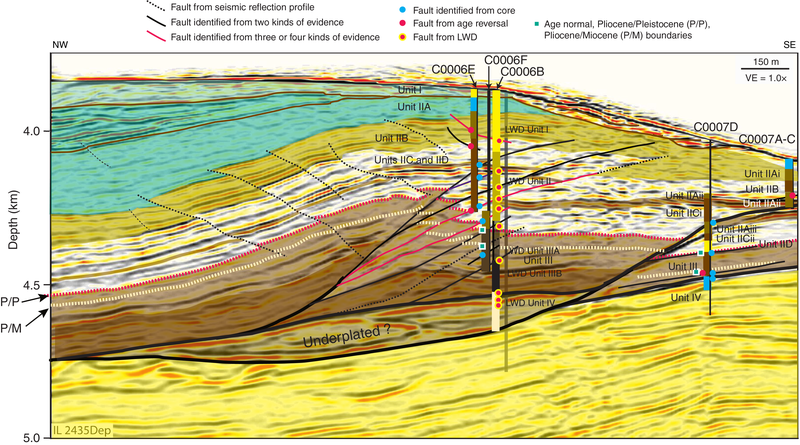 From examination of the Site C0006 cores, Expedition 316 Scientists (2009) identified three primary lithologic units (Figure F4). Unit I extends from the seafloor to ~27 mbsf and comprises Pleistocene trench to slope transition facies. Unit II is composed of Pleistocene trench deposits divided into four subunits based mainly on variations in silt and sand content, with significant repetition of sequences caused by numerous thrust faults. Unit II extends to ~407 mbsf in Hole C0006E and ~450 mbsf in Hole C00006F. Subunit IIA comprises mainly sand-dominated trench wedge deposits, Subunit IIB comprises mixed sand-mud trench wedge deposits, Subunit IIC comprises mud-dominated trench wedge deposits, and Subunit IID comprises deep-marine basin to mud-dominated trench transition deposits. Unit III comprises late Miocene to Pleistocene deep-marine basin deposits. Figure F4. Seismic section and logging and coring results. Four primary logging units (Figure F2) were identified based on differing trends and LWD log responses (Expedition 314 Scientists, 2009). Logging Unit I (0–197.8 m LWD depth below seafloor [LSF]) was interpreted as sandy and muddy deposits. Logging Unit II (197.8–428.3 m LSF) was interpreted as mud with occasional thick sand layers. Logging Unit III (428.3–711.5 m LSF) was identified as alternating beds of mud and sand and is divided into two subunits. The boundary between Logging Units II and III might be a fault zone (Figure F4), but this interpretation is not certain. Logging Unit IV (711.5 m LSF to total depth) was interpreted as underthrust, coarse trench-fill sediments. The main frontal thrust was identified by a sudden decrease in gamma radiation (from ~90 to 20–50 gAPI) across the Logging Unit III/IV boundary. Based on these results, the target zone for the main LTBMS instrument package (strainmeter/seismometer/tiltmeter/pressure sensor) was selected within the deepest part of Logging Unit II at ~410–425 mbsf (Figure F4). Here, the formation was expected to be relatively competent mudstones suitable for monitoring formation pressure and deformation in the hanging wall at the frontal toe of the prism. With the main package at 410–425 mbsf, the LTBMS design also allowed for (1) a deeper pressure monitoring screen at ~455–456 mbsf within the open hole below the boundary between Logging Units II and III and (2) placement of the five thermistor cable sensors from ~412 to 237 mbsf, which spans much of Lithologic Subunit IIC. As described in Operations in the Site C0006 chapter (Kinoshita et al., 2018b), the LTBMS was successfully installed as of 5 February 2018. At the final sensor checks, all instruments and sensors tested properly with one minor exception: the deepest sensor on the five-sensor thermistor cable. After connecting the LTBMS to DONET, all sensors on the thermistor cable appeared to be working normally. The final configuration of the installed LTBMS is illustrated in Figure F5. Figure F5. Hole C0006G LTBMS. Heki, K., 2007. Secular, transient, and seasonal crustal movements in Japan from a dense GPS array: implication for plate dynamics in convergent boundaries. In Dixon, T.H., and Moore, J.C. (Eds. ), The Seismogenic Zone of Subduction Thrust Faults: New York (Columbia University Press), 512–539. 2 Expedition 380 Scientists’ affiliations. F2. Interpreted seismic cross section and LTBMS site locations. F3. Interpreted seismic depth section. F4. Seismic section and logging and coring results.